JD Oleinik has spent his life selling doctors the latest advances in pharceutical drugs. He’d still be doing it today if he hadn’t stumbled on an epiphany. A dependable part of any rep’s success came from pharmaceutical compounding: drugs uniquely created to fit the specific needs of individual patients. The concept had existed for centuries. However, the idea of physicians operating their own compounding pharmacies… was a new one. With staggering potential. Enter Solaris. A company offering a turnkey model that gave physicians an unrealized, unlimited new revenue stream. 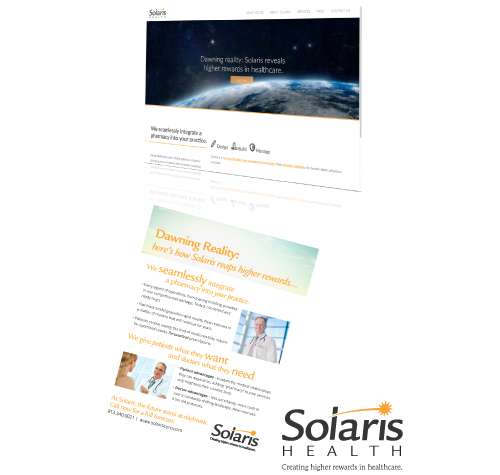 We engineered a Creative Strategy, Positioning Statement and introductory website. We created a Phase One presentation brochure for physicians and designed a coordinated PowerPoint. Future projects will include a social media campaign and short webvideos that demonstrate – visually, believably, dramatically – exactly how the process works. JD and his team are rolling out our marketing materials nationally to introduce (often incredulous) physicians to a new vision. One that could transform their approach to medicine.